THAILAND Wakeboard Camp - Dok Krai Lake, Rayong Guests overall rating: ★★★★★ 5 based on 3 reviews. Come over to Thailand, enjoy the sun and have some fun! 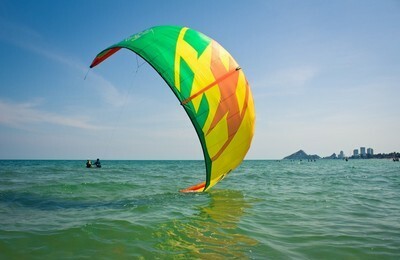 Hua Hin Kitesurf Hotel - Hua Hin, Thailand Guests overall rating: ★★★★★ 5 based on 4 reviews. Kiteboarding school and apartments are situated only 50 meters from the beach and 10 minutes walking from the Market Village of Hua Hin. Superior rooms in guesthouse with 2 single beds or 1 double bed, with private bathroom, sea view, patio area, terrace and car park. Activities in the vicinity: kitesurfing, SUP, windsurfing, horse riding, night club, fishing, golf, cinema, water sports, jet ski, leisure park, hiking. Kiteboarding season is from October to May.